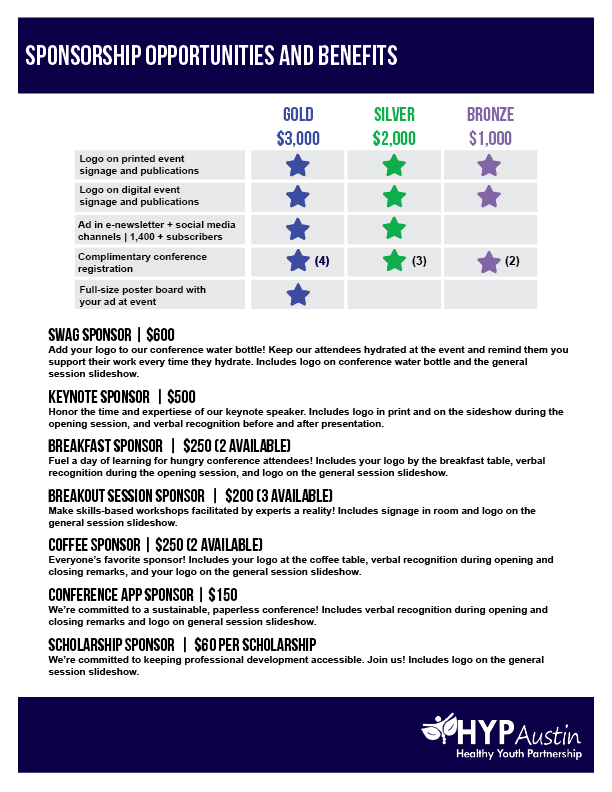 Sponsor the 8th Annual HYP Provider Conference! The HYP Provider Conference in a grassroots, 100% volunteer-led event that we have been able to offer our community for the past 8 years, thanks to generous sponsors in our community. Learn more about how you can promote positive youth development in Central ATX this year! If you, your organization, or place of business would like to sponsor the 2018 HYP Provider Conference, please email info@hypaustin.org with your contact information and sponsorship level commitment. We also welcome business sponsored services for our event. Checks can be made out to Healthy Youth Partnership and mailed to Healthy Youth Partnership, PO Box 49956 Austin, TX 78765. Online payment will be available soon! Please email with inquiries.